Ajax closed the gap on Eredivisie leaders PSV Eindhoven to six points with a 4-0 victory over bottom-club Excelsior. A Klaas Jan Huntelaar brace and goals from Urby Emanuelson and Leonardo secured an easy victory. Meanwhile, PSV suffered a 3-1 at FC Utrecht. Despite taking the lead through a Timmy Simons penalty, the table-toppers slipped to their fourth defeat of the season. All four Ajax goals from their victory over PSV Eindhoven. And meet the new Holland national team coach. 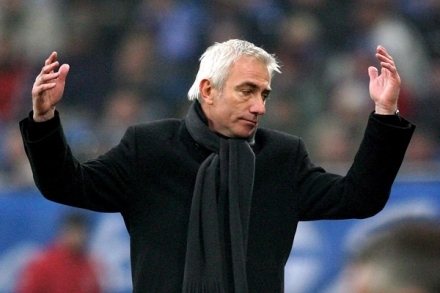 Bert van Marwijk is currently at the helm of Feyenoord but will succeed Marco Van Basten as the Oranje coach after Euro 2008 (94 days until the big kick off, by the way).